Welcome to the latest edition of our newsletter, with updates on our products and company news. Over the coming months we will be participating in a range of exhibitions and look forward to seeing you there, read on for further details. The Askion cw Laser Module are made from a flexible platform that encompasses the UV to NIR wavelength range using laser diodes and DPSS laser (for 532nm) technology. Wavelength, beam profile and output power are customer defined for user flexibility. Available wavelengths are 408, 445, 473, 488, 515, 532, 638, 650 and 685nm with powers available up to 300mW, which can also be adjusted manually. An RS232 port also provides access to command the unit and provide information on the unit status. The power unit (driven by 4.5 to 15V; max 2.5A) is also integrated into the package providing the unit with a very small footprint 100x40x40mm. The module can also be operated in different modes to provide power stability or constant current into the device and can provide polarization of better than 1:100 over the entire dynamic range. Superlum and FLC have decided to join forces to assist customers in Europe and USA. FLC will now offer a complete line of Superlum products providing technical support and short turn-around from it’s head office in Germany and US Sales Office in California. 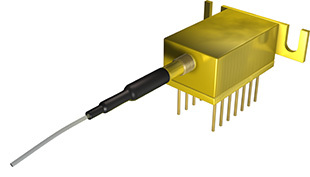 Frankfurt Laser Frankfurt Laser Company offers the complete line of superluminescent diodes in 680nm and 770-1670nm wavelength range. The products demonstrate wide emission flat spectrum, low ripple <1% and negligible to none secondary coherence sub peeks. 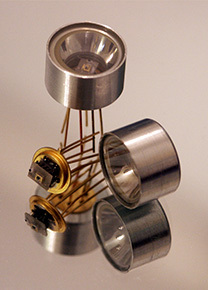 Superluminescent diodes are supplied in industry standard cooled (TO-3, DIL-14 and butterfly) and uncooled (TO-56, SOT-148, coaxial) free space and fiber-coupled packages. SLD can be customized. Low price large volume OEM application models are available. FLC has come into agreement with LED Microsensor NT of St. Petersburg, Russia to distribute its LED'S and PD's that operate in the Mid Infrared range from 1.58µm to 4.45µm through its network of international sales partners worldwide. Due to advances in measuring technology these LED's are ideally suited for use in gas measurement; this can be measuring the concentration of a particular gas or the existence of a particular gas type within air. Such sensors offer a reliable, instant and non-contact method of gas detection. 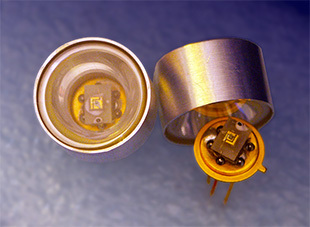 The individual LED's and Photodiodes are a cost effective and are small enough to be integrated into the smallest of packages. Operating over a wide temperature range allows them to be used in a variety of environments. LED's can be either used in Quasi CW or pulsed mode operation to obtain either a high average power output or a high peak power output. As an addition to the package options, which are TO18 and TO5 can both LED's and PD's can be equipped with a parabolic reflector to either decrease beam divergence or increase the light gathering power respectively. With a complete set of drive electronics available this allows an easy set-up solution to enable quick and easy experimentation. Frankfurt Laser Company will be exhibiting at this exciting fair for state of the art laboratory technology and science equipment with its range of exciting products, we look forward to seeing you there.